We’ve all been there – the doorbell rings and suddenly your tranquil home becomes a flurry of barking, running, jumping and nervous anticipation. Alarm, Alarm! There’s somebody out there trying to get in! Alarm, alarm! All hands on deck! Everybody man their battle stations like it’s the beginning of World War III! Of course, I’m somewhat exaggerating, but there are certainly some of you to whom this picture falls quite close to the real situation. So what to do when all hell breaks loose for such a mundane reason? As always, before we can come to a satisfactory solution we must first understand the cause of the problem at hand. Not all dogs react to the doorbell for the same reason. Some do it because they are afraid of strangers, some because they are irritated by the sound of the bell, some from the simple exhilarating joy of meeting somebody new and some out of territorial aggression aimed at strangers encroaching their space. An opening of the front door also provides the more adventurous ones with an opportunity to slip out and explore the great outdoors. It could also be some sort of a combination of two or more of these reasons. 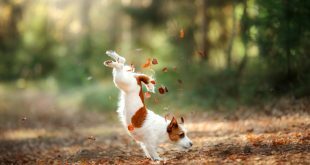 All of these problems need a somewhat different approach and the best way to determine what is going on is to observe your pooch and gauge his/her reactions. Look at their posture. 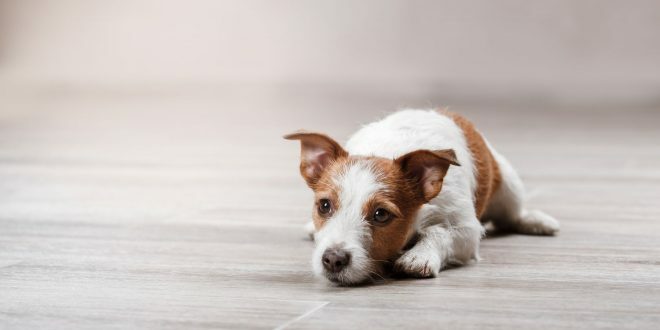 If they are nervous, wary, cowering and showing signs of stress like running away from the door, hiding behind you, ears flat behind their head, tail between their legs that means that the problem lies in stress and fear and not overeagerness and aggression. On the other hand, if they show signs of aggression – growl, prick their ears forwards, generally tense their muscles and look like they’re ready to pounce they could be nervous about strangers coming into their domain and are preparing to defend themselves (and you) from the perceived threat. What if they’re sensitive to sound? If you know that your dog is overly sound-sensitive the problem likely lies in your ringtone. They bark and get mad because the ringing is too loud or the sound is too irritating for them and they want it to stop – remember that their hearing is much better than ours. The solution, in this case, is simple – try out other ringtones with them by your side, and replace your old one with the one that gets the least reaction from them. The first one is to train your four-legged friend to respond with calm and greet your guests with good manners, and the other one is to train them to remove themselves away from the door as soon as they hear the bell ring. The former is best suited for pets that are more mild-mannered – those that bark just to warn you that somebody is there and those that are more scared than aggressive. 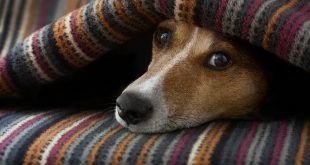 The latter approach is better suited for dogs that act more out of territorial aggression, want to seize the opportunity to bolt out the door or are simply overly active and so hyped that somebody is coming over that they’ll start pestering you and your guests even before they came through the door. If you want to train them to handle the situation calmly by your side you should first mark a place with a blanket or a pillow in the hallway where you want them to calmly sit while you greet your guests. This kind of training is a two-person operation – somebody should help you by ringing the doorbell behind closed doors outside while you deal with the situation inside. Before you start training decide on a verbal cue with which you’ll mark the action. First, you need to train them to stay quietly in place. When the doorbell rings instruct them to sit in the designated area and give them a treat. They don’t get any treats if they bark or move from their position. When they’ve mastered this try moving away from them towards the door. They get a treat for every step that you make while they quietly stay in place. If they become restless stop moving and ignore them until they settle down again and then reward them. Repeat until they mastered the routine. You should then continue training with your designated helper. He/she should play a role of a new visitor coming in. 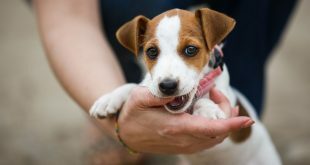 There’s a big chance that in the first few tries your pooch won’t stay in place but instead go at them for a greeting. You should then give them the designated command to stay in place and if they obey give them a treat. Your “visitor” should ignore them until they behave properly and only then reward them with a tasty treat or a cuddle. The same applies when the real thing happens. You can even place a container full of treats outside your door just for such occasions and instruct your guests what to do and how to behave. The goal is for your dog to start associating that place and that kind of behavior with yummy and pleasant things and after a lot of repeating they’ll start doing it automatically every time the doorbell chimes. After they mastered the routine don’t cut them off the treats completely but give them some intermittently so they don’t lose interest and revert to their old ways. When all else fails, or if you’re dealing with a dog that’s really hyped up, aggressive, or has a tendency to run off through an open door without consideration for your plans or their own safety, this is your best option. Choose a part of your house/apartment to isolate your pets when you have visitors (at least until everybody calms down and gets comfortable). It can be a room or a part of your home where you already installed a doggy fence. It doesn’t matter as long as you know that your pets are going to be comfortable and have everything they need for the time being. Training them to go to their designated area is pretty straightforward. Ask someone to help you ring the doorbell, same as before. Before you start training decide on a verbal cue with which you’ll mark the action. When the doorbell rings lure them with high value treats into the area that you chose and after you close the doors go open the front door. Make sure that they have something fun to do and play with to distract their attention from all the commotion. After some practice, they’ll start associating the doorbell with fun time and automatically start going there even without your input. But what if they’re scared of visitors? Then you have to show them that there isn’t anything to be worried about. Make the experience as pleasant and fun as possible. Associate the doorbell and guests with positive things like yummy treats and maintain a happy and perky attitude when answering the doorbell so that they see there’s nothing to worry about. You can also leave some treats in a container in front of your door and instruct your visitors to give some to your four-legged companion when they come in, but only if they behave nicely – no barking or jumping allowed. This will encourage your pet that everything is OK and that having other people over is a pleasant and relaxed event. If they are resistant to your tactics or continue to be anxious you should definitely consult with a veterinary behaviorist. Getting your furry darling to behave and accept the doorbell and all the excitement that it announces isn’t an easy task but it’s worth it. Everybody involved will be under much less stress and the whole experience will be much more pleasurable. As long as you first understand why they’re reacting the way they are you’ll be able to figure out the right approach for the situation. Share your experiences, thoughts, and suggestions on the subject in the comments below.